We knew the end was coming soon, that the Night’s King is marching his army towards Eastwatch as quickly, or perhaps more quickly, than houses south of the wall are toppling and rising, trading places and swapping sides. But even armed with this knowledge, the events of “The Queen’s Justice”, the third episode of the seventh season of Game of Thrones, seem to unfold at an almost breakneck pace, hurtling viewers from location to location, ricocheting between characters and delivering long-promised reunions and battle sequences both. There’s not a single moment of rest here; the minute you think you can settle back for one of the show’s iconic political knowledge monologues set to stirring music, to use the colloquialism, sh*t gets real. Where to start? There are so many bristling/joyful/suspenseful/tragic meetings that it’s almost hard to choose. Perhaps the most “politically” relevant is Jon Snow’s audience with Daenerys. Jon and his chief advisor, Davos, are wowed by Dany’s dragons, and the might of her army (Davos sardonically comments that Dragonstone has changed a bit since he was last there), but now wowed enough to make Jon simply shrug off the still-to-be-hard-won independence of the North, and pledge his fealty to Dany as queen of the Seven Kingdoms. 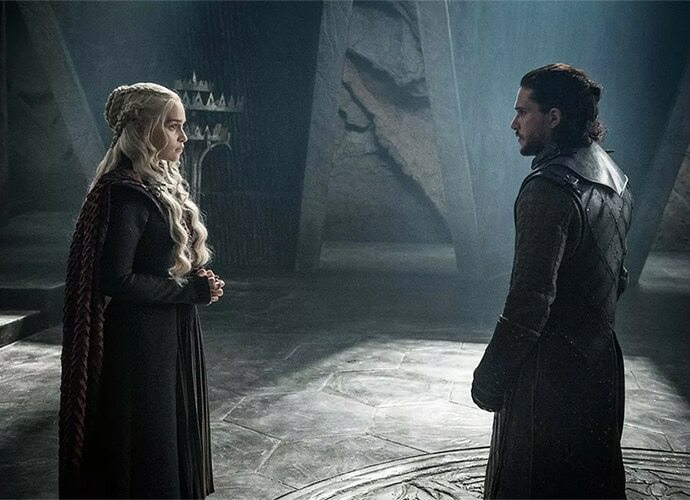 Dany, meanwhile, is unimpressed by this brooding stranger’s tales of White Walkers and Night’s Kings, and not so nicely tells him that if he refuses to renew the ancient alliance between Targaryens and Starks, she will consider him in open rebellion. Tyrion is visibly upset by all this, and after some careful nudging from him, Dany agrees to reconsider Jon’s tall tales. After all, she too has done and seen many things that might have been considered impossible, so in the spirit of "building a productive alliance", she agrees to let him mine the dragonglass mountain on the island. Jon is happy, Dany loses nothing, all is well. Up in the north, Sansa is preparing like a good general for the winter, with a whispering Littlefinger by her side. Their whispery politics class is interrupted by an arrival: Bran, the last “trueborn son” of Ned Stark has returned to Winterfell. After an emotional reunion, the Stark siblings sit in the Godswood, where Bran rather flatly tells his sister he “can’t be lord of anything”, since he is the Three-Eyed-Raven. In rather typically teenage surliness, he refuses to explain much, only driving Sansa away with a rather eerie description of her doomed wedding night. It’s the first time we’ve seen Sansa’s mask crumble in three episodes, as she walks away from her brother, visibly rattled and upset by the memories he churns to the surface. Bran, for his part, appears to be losing what makes him human, any sense of the feelings of the people around him. His role as three-eyed raven is what defines him now, creating a gulf between him and the rest of the herd, in the same way that Beric Dondarrion’s role as a warrior of R’hollor, or Melisandre’s as a soldier of the same Lord of Light, drives her to use people and shape events regardless of any personal feelings of those whose lives she plays with. Speaking of Melisandre, she has a long-delayed meeting with another important advisor, Varys. The two present almost polar opposites in the universe of Ice and Fire. Varys, who works with “realities” like people and their political power, has a long-standing hatred of anything to do with sorcery, particularly that which involves fire. Melisandre is the epitome of these forces, so there is no love lost in his words to her, when he tells her explicitly to "never set foot" in Westeros again. Melisandre has the last word however, cryptically commenting that she must die in this “strange country”, just like him. Varys’s end has never been mentioned, or even built up in the show, since he is a rather secondary character, but the idea that he too is involved in some strange prophecy, more so one known to a servant of the Red God is surprising not just to him, but most viewers in general. The team that definitely “won” this episode though? The Lannisters. During a rather dramatic return to King’s Landing, Euron parades his trophies: Yara, Ellaria and Tyene, and throws them at Cersei’s not-so-tender mercy. This is where the title of the episode makes sense. "The Queen" in this case is Cersei, who wreaks, both personally and through her army led by Jaime, "justice" on those who committed the most horrible crimes against her: taking away her children. Ellaria Sand is forced to watch as Cersei uses the very same poison on her Tyene that she herself used to dispatch Myrcella. Though it looked for a moment as though the Lannisters would lose Casterly Rock to the Unsullied, victory proves premature for Dany’s forces. Euron Greyjoy, who seems to have the power to teleport, shows up with his navy, and pens them in, leaving their fate uncertain. Meanwhile, further south in verdant Highgarden, Jaime, leading an army that also includes the hard-pressed Randyll Tarly, his son Dickon, and the much-missed Bronn, soundly defeats the Tyrells, and sees over the demise of Olenna Tyrell. Her last words to him, though, are a blow: she confesses to killing Joffrey, and tells him she wants Cersei to know it. Jaime’s face is a study in anguish and rage when he hears this, but whether he will tell Cersei remains a question. There doesn’t seem any point any longer, since she seems too far gone in her pursuit of vengeance, or what she might call "justice", to care for details. So much happens in this episode, so many characters are seen, that to find a unifying thread is near impossible. In fact, chaos itself could be seen as a theme. As Bran notes, events are being shown to him "in pieces", and he, as the Three Eyed Raven, faces the task of stitching them together into a cohesive narrative. Plots and schemes, victory and defeat are erupting around Westeros, despite what looked, at the beginning, to be an almost one-sided victory for Daenerys. People are refusing to fall easily along lines of alliance (Jon), characters show grit and determination when not expected to (hooray for Sansa), and the impossible has become real so often that it’s hard for some to trust, or even deny, stories altogether (Dany). There’s some comfort, then, when characters like Sam still manage to win through the day by following old, written advice. His near-miraculous cure of Jorah Mormont, a ray of sunshine in a rapidly-snow-clouded Westeros, comes not because of any strange turn of events or Fire God-fuelled power. “I read a book and followed the instructions” is a rare and special thing to hear in this fantasy world; perhaps once the game of thrones is done and a victor finally crowned, more citizens of Westeros will be able to say it with a sense of satisfaction.